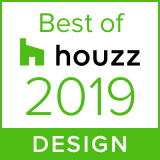 We’re very proud to announce 5 wins in the 2019 Detroit Home Awards. To all of our suppliers, trades, partners, and homeowners: we couldn’t have done it without you! Pick up the April issue of Detroit Home to see all the winners and check out our featured wins and awards below.